After doing a bit of a poll for content requests on Instagram, I’m bringing back in some lifestyle content that you guys were hoping to see! One of those topics is to feature the healthy recipes I’m always whipping up over on my Instagram Stories… so with that, today I’m sharing three delicious and healthy salad recipes that require very little prep work. Perfect for those quick lunches or an effortless post-work dinner! To make these recipes even easier to whip up in a flash, I recommend buying the packaged and pre-washed iceberg, butter lettuce and spinach available in most grocery stores. Take the Iceberg out of the package and chop up into bite-sized pieces. Put the cut up lettuce back into the package and pour a tablespoon or two of Primal Kitchen’s Vegan Ranch on it. Put the cover back on and shake the package until the dressing is mixed in. Pour dressed lettuce onto a plate or bowl. 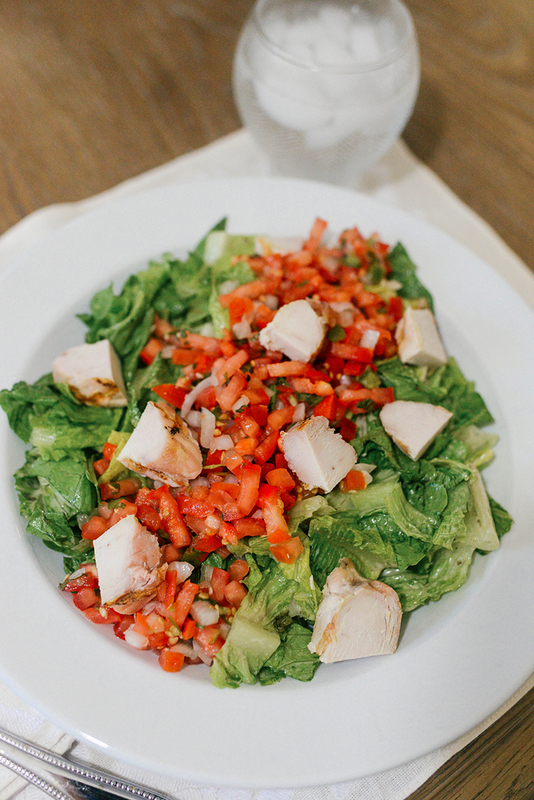 Top with several spoonfuls of pico de gallo and chicken! I LOVE pico, so I add a lot. I love the prepared pico you can buy in the produce section at Whole Foods (most grocery stores have pre-made pico, guac, etc – at least they do in Texas! 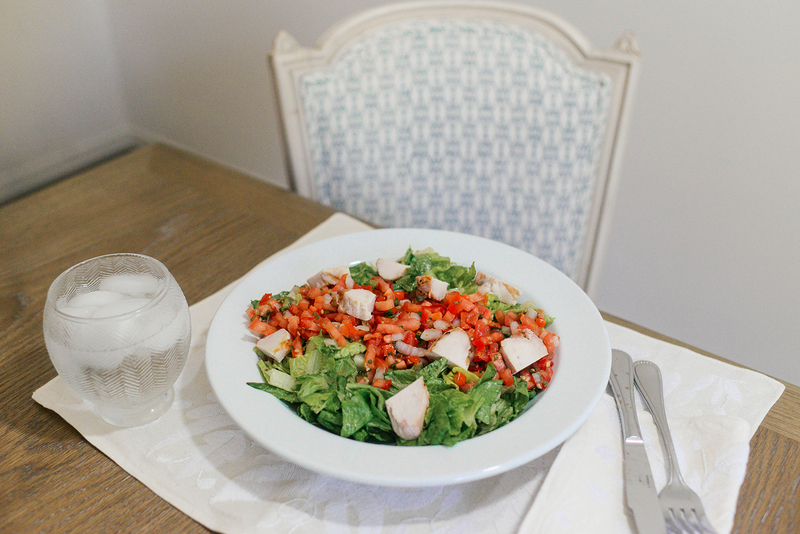 ), which makes this truly the easiest salad recipe to make. If your store doesn’t have pre-made pico or you prefer to make it yourself, check this one out! Remember this recipe? I love it so much. Lately I’ve been leaving the avocado out to cut down on calories and putting it over a bed of butter lettuce instead. So, so good! You can get creative with this too. I’ve added pesto, chicken, artichoke hearts, etc! This combo tastes good with so much! For the butter lettuce salad recipe: cut up the butter lettuce and place in a large bowl. Drain and then pour half a can of salad cut hearts of palm into the bowl. Chop up one tomato and pour into the bowl. Sprinkle with salt and pepper, squeeze a little fresh lemon and then drizzle with olive oil. The only prep work involved in this one is cutting up the strawberries! Throw spinach in a bowl with a small handful of pecans, a sprinkling of goat cheese and 3-4 sliced strawberries. Top it with an apple cider vinaigrette and you’re good to go! 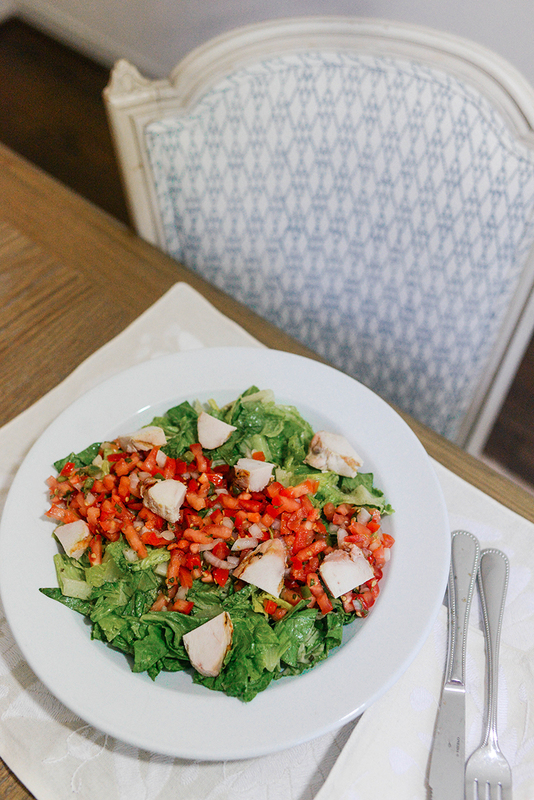 So many great flavors – this salad is a wonderful option for those with a sweet tooth. They all sound wonderful! The butter lettuce reminded me of one I used to enjoy in Paris. I think you might like it — butter lettuce, topped with a small baked goat cheese round, and pine nuts. Bon appétit !